Many email accounts, including Microsoft Exchange accounts, Outlook.com, Hotmail.com, and Live.com accounts, Office 365 accounts, and other POP and IMAP accounts can be added using Outlook’s automatic setup option. You can use these instructions to add your first account or additional accounts. Note: For all email accounts, your username is your full email address. Open Outlook and select File > Add Account. Note: Outlook 2007 users should select Tools > Account Settings. On the Email tab, select New. 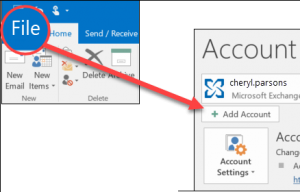 For Outlook 2016, enter your email address, then select Connect. For Outlook 2013 and Outlook 2010, select Email Account and then enter your name, email address, and password. Then select Next. If prompted, enter your password again, then select OK, and Finish to start using Outlook.